PG1 gearbox strip down, conversion and rebuilding. First the guide assumes you have the gearbox removed from the car. There are plenty of online helps guides to help with that side of things. If your box is still in the car then it's an idea to drain the oil from it before removal. You need a 3/8" socket drive for this. It also helps if you loosen this cap. A 14mm Allen key is needed. So first off you need to know the type of box you have. This is a T series, L series diesel or KV6 type of box. This one is a K series 4 cylinder one. If you are lucky enough to have the stickers on, you can identify what ratios are inside them. Use this link as a guide. The box could be a U spec box if there is "U" in the code. These have a stronger main shaft and bearings. Pictures further down this page. So to start the strip down of the box you need to remove this bolt, 14mm socket and the reverse switch 19mm spanner. Also remove the cap on the end of the box with the 14mm Allen key. Remove all the bolts around the outer edge of the casing. 12mm. Using a cold chisel, knock these lugs (similar on other side, not shown) and the box will open up, but only a small amount. You will then see the box is only held at one point. Lay it flat down with the diff on the right. This guide assumes the box is kept in this position. Insert two pry bars into the opened up gap. Look inside the cap you have removed. There is a circlip which has to be held open, whilst prising the casing of the box. Once this has passed it's slot in the bearing, the casing will lift off. Then the box should open up like this. If it's a U spec box. You can see the bigger bearing on the main shaft. The casing has to match the type of spec the box is. The circlip for the bearing is in a different location on the U spec. This is a non U spec. Non U spec top casing. If the bearing is till on top of the input shaft, insert a small screwdriver into the gap and gently ease up the bearing from the shaft. +++NOTE+++ The 5th gear selector is flush with the inner pieces. This is the most common mistake when building these boxes. On the left side of the box are 4 bolts, 10mm. Remove these. 3 are black one is gold. They are not all the same length so take note of the order. Next remove this long bolt also 10mm. Remove the reverse gear linkage. Remover the reverse gear sprocket and shaft with plastic ring. All that is holding the gear sets in the box now is gravity. Hold the bottom gear of both gear sets and the selector forks. Wiggle them about until they are able to lift out. NOTE, on the input shaft all the gears will slide on the shaft and fall off if turned upside down. Please be careful! Place these on something clean. In order to remove the differential, turn the box over and push it out thought the seal. Check the bearings. 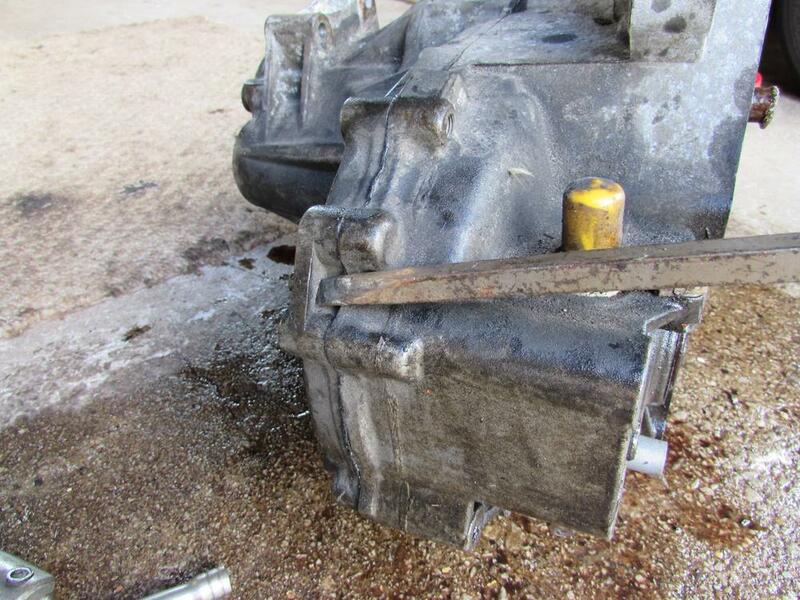 These are the main failure on a PG1 gearbox. Steel bearings are a good upgrade if running over 200bhp or 170ft/lbs of torque. The bearings are removed by inserting a cold chisel or large screwdriver into the gap and tapping them off the diff. Tap one side then the opposite side and it will come off a mm at a time. Be careful on the side with the speedo drive on it. Try to keep the chisel towards the inside of the bearing as the outer edge of the drive could easily break if given too much abuse due to not being supported. The speedo drive is simply held on by the bearing. It has a location on the back of it. If you are wanting to swap the final drive or add an LSD into the box, you need to remove the crown wheel. Hold it in a vice. Using a breaker bar, undo the bolts by passing the bar over the centre of the diff. You will find this helps with leverage (please ignore all my junk!). Fit the crown wheel in the same way as removing it. On this one, I opted for new steel caged bearings, fitted with the writing on the bearing outwards. If the original type of bearings with plastic cages are used then the plastic goes to the outer edge. Rebuild the diff by tapping the new bearings on with a mallet making sure the speedo drive is in it's location. The bottom bearing for the main shaft (centre of picture) are different sizes dependant on if it's a U spec. Or a non U spec. If you want to fit a ratio set that is U spec into your non U spec box, then you have to swap the main bearings over. On the U spec box, remove the 2, 8mm bolts and retainer plate. There is nothing on the non U spec. Turn over the casing and place a rag underneath it. Fill the kettle and boil it. Dribble the boiling water over the centre of the bellhousing for a minute. Using a mallet, hit the bellhousing ribs around the area of the bearing. DO NOT hit the central part of the aluminium as it's soft and will break. After a few taps, the bearing just falls out. Use the same method of heating the aluminium to swap replacement bearing into the hole. Tap with a mallet until it goes flush. It's a good idea to clean the magnet in the bottom of the box. A long screwdriver is used to just prise it out. On this box, the diff bearings were on there way out. You can see the amount of swarf this has collected! Clean the outer edge of the box from all of the original sealant. A sharp knife or scraper is best. Do not use sandpaper as this will leave sand inside the gearbox. Last edited by AGoaty; 08-04-2019 at 03:15 PM. Place the diff back into position. Make sure the forks are engaged into the selectors on the gear sets. Pick up the sets of gears by the bottom gear, including the selector forks and place then back into their location in the bellhousing. They need to be carefully positioned as not to damage the seals when dropped in place. The selector forks have 2 shafts. These locate in two holes in the bellhousing. Look at the sets of gears. Each one should have it's fork and selector ring in the middle of the gears. If not, adjust them until they are. This is the box in neutral. Using a long 8mm bolt place that through the hole in the selector shaft. Push and pull the shaft. You can feel it has 3 positions. Leave it in the middle position. The selector box is quite tricky to get lined up. There is a ball and lug on the bottom that locates in the bottom of the box. There are 3 lugs on the selector forks which slide on the shaft. These match a location on the selector box. Then in order to hold the right shaft in place, it has a small slot in the bottom. The selector box fits in this too and usually the 5th gear fork can be lifted slightly in order to get this in. The reverse gear shaft, sprocket and plastic ring can now be fitted. Look at the reverse gear selector arm. It should have a ball bearing that clicks in place when moved. I have seen these break so will not stay in gear if fitted like that. If it's ok, then fit that. When happy all the bits line up in the locations, put the 5, 10mm bolts back in and nip them up. Put your hand on top of the 5th gear and operate the selector shaft via the 8mm bolt, in/out to check the box selects gears correctly. You need to find neutral and twist the bolt in order to get 1st, 2nd, 5th and reverse. Assuming everything is ok, double check the 5th gear. If the inner part of the 5th gear has fallen out at any point make sure it is fitted back correctly. It has a central boss that is proud on the top and flush underneath. It also has the sychromesh ring inside the gear which has 3 lugs on it. It's very important to get the lugs into the slots with this the correct way up! Place the bearing on top. The box is now ready to have the casing test fitted. Put the casing on top and just using body weight, push it down and wiggle it. This mostly needs an assistant as the circlip that is inside the cap needs opening again to get the casing closed. Once fitted, the casing has no gap. If the is a gap, there is something wrong. DO NOT just close the case with the bolts! Assuming everything is good, open the box again. Run a thin layer of sealant around the edge of the box. Don't go mad or the sealer will end up inside the box it'self. Place the casing back on and open the circlip to close it fully. Fit the 12mm bolts around the outer edge. Refit the 14mm bolt for the reverse gear shaft and also the reverse switch. Test the gear selector using the 8mm bolt. Once happy, put the box in neutral. Turn the turn input shaft and hold the diff. It should not spin. Put the box so you can see the bellhousing insides. The clutch bearing fork is visible. Remove the 12mm bolt. The shaft should be very loose but very often seize up. Some oil or WD40 on the shaft helps. With a little brute force and a lot of forward and backward movements, pull the clutch arm out. Clean it up with emery cloth and then copper grease the shaft and hole. Insert again with the fork and replace the 12mm bolt. This should now be loose in operation. I hope this guide has helped. Last edited by AGoaty; 10-09-2018 at 06:03 AM. The PG1 gearbox is fitted into a lot of different applications. It has a very good reputation for reliability with some cars running huge horse power. In a Mini these have quite an easy life but the main reasons for taking them apart is to swap the ratio's, final drive or add an LSD. Swapping gear sets from one box to another is possible. Use the gear charts available online to find a suitable donor box. If you need to swap the final drive over from one set to another, first you must stick to the U spec box, or non U spec. The crown wheel and pinion are a matched pair. If you change one, you need to change the other too. The pinion is part of the main shaft. In order to swap it, with the gear sets in the box and selector forks in place but no selector box fitted, you can select 1st and 3rd gears at the same time. This locks the gear sets from spinning. The top nut on the main shaft can now be removed. NOTE, it's a left hand thread! With the nut loose, remove the gear sets. Place on something clean. Lift off the selector forks. Separate the main shaft set. Remove the top nut from the main shaft. Carefully slide off the gear sets keeping all the parts together. If any of the gears go adrift, check it's location on the shaft by looking at the brass ring lugs and make sure they locate into their slots. The standard open diff can be swapped to either a Torsen type A or B. These are available second hand and vary in price vastly. Current value is anything from £100 to £350. The Quaife ATB LSD is also a straight swap. These are available new at £700 or occasionally do come up second hand around £500. Both these diffs will be great in a road going car and don't need any servicing. You could fit a plate diff. These are more for motor sport as actually lock the wheels. The issue is these need to be set but the way to set or adjust them is to remove the box, strip it down, adjust and refit. A lot of work in my opinion! Using a box from a different vehicle. Rover/MG are a pain for making so many varieties of clutch operation. This box is fitted into loads of cars. There at least 3 types of clutch lever. These can be swapped from one box to another to suit your needs. They are cable on a ZR, hydraulic on a MG F or sealed hydraulic on a ZS. The main thing is what ever you have chosen, you get it greased up correctly! If anyone has any questions on the guide or want to know what is possible, add these below. Last edited by AGoaty; 10-09-2018 at 06:44 AM. As I have just done this on my own Mini I will show what is possible. I have swapped gears 3, 4 and 5 from a Freelander (S4) box into my C4 (MG F VVC) one. This will give better cruising gears for motorway use. Both boxes stripped as earlier posts have shown. Then you can remove the sets of gears onto something clean. The main shaft has a nut holding the gears on. This is a left handed thread. With this nut removed the gear set will slide off. All of the boxes use the same synchromesh parts. You must swap matching pairs of sprockets over to achieve your choice of ratio. A few limitations of this are that gears 1 and 2 are part of the input shaft. If you want to use these gears from a different box then the correct input shaft must be used. With the gears removed, check all the roller bearings are in good condition. This is a non U spec main shaft. The bottom of the shaft is smaller diameter than the U spec. Also the splines at the top are a different diameter too. This means the 5th gear must suit the shaft, meaning U spec or not. The main shaft has the pinion built into it so this needs to be correct for the final drive choice. The picture is a 15 tooth, 4.2 version. On the main shaft there is 1 washer between the 1st gear and pinion. If swapping gears over these can stick to the 1st gear and you could end up with 2 on there accidentally! With all the gears swapped over, they should all fit together with all the gears mating equally. Check all the syncromesh pieces in particular the brass rings. These should have square edges on the lugs but can easily be worn or damaged. Also the spring around the edge of it is there and not bent. Sorry it's a poor picture. Last edited by AGoaty; 08-04-2019 at 03:24 PM.